CHITARRA ELETTRICA CON TASTIERA A 132 LUCI LED. The New Fretlight Wireless guitars are an amazing blend of traditional instrument craftsmanship and technology. Fretlight is the only guitar in the world with a built-in lighted learning system. The instruments have all the features you'd expect from a normal guitar such as 1/4" output jacks, pickup selections, two-way truss rods and incredibly straight necks. The learning system is there at the push of a button when you want it - or need it. And like all guitars you can customize pickups, put on your favorite strings and have it set up to your liking. Play like a rock star with the new FG-651 Orianthi Limited Edition Fretlight Wireless Guitar. Designed by Ori herself, this guitar is one of a kind. 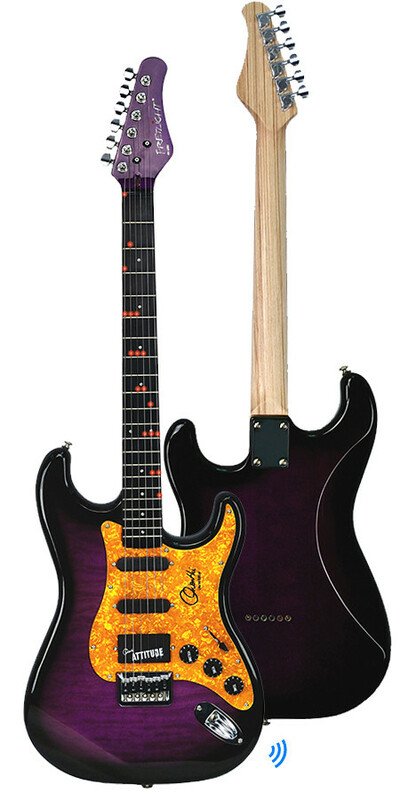 Orianthi wanted to make a statement in both sound, design, and functionality. The FG-651 Electric includes our patented wireless lighted learning system and allows a player to light-up songs, chords, scales and riffs right on the neck of the guitar. The Fretlight Wireless Ori Electric connects to a smartphone or tablet via Bluetooth BLE. A variety of apps are available on the App store and Google play which allow users to see chords and scales, purchase video lessons, see tablature, improvise over progressions and much more! The Fretlight Wireless guitar utilizes Bluetooth BLE technology. Your mobile device must have Bluetooth BLE, commonly referred to as Bluetooth 4.0, to connect to a Fretlight Wireless guitar. Transmission range will vary, 10-15 feet is best, up to 50 feet is common. Go here to check out all the apps that are available for the Fretlight Wireless guitar. The Fretlight Wireless guitar works with Apple (iOS 8.4+) and Android (OS 4.4+) devices with Bluetooth BLE (v4.0+). FRETLIGHT GUITAR 521 TRADITIONAL ELECTRIC POWDER BLUE. SUONI SUBITO TUTTE LE CANZONI CHE VUOI, TUTTI GLI ASSOLI, ANCHE SENZA SAPER LEGGERE LA MUSICA, SENZA FATICA ! ! ! QUESTA CHITARRA è IL METODO PIù, VELOCE E SEMPLICE PER IMPARARE A SUONARE UNA SONG, UN'ASSOLO, ACCORDI, SCALE, ARPEGGI, ECC. 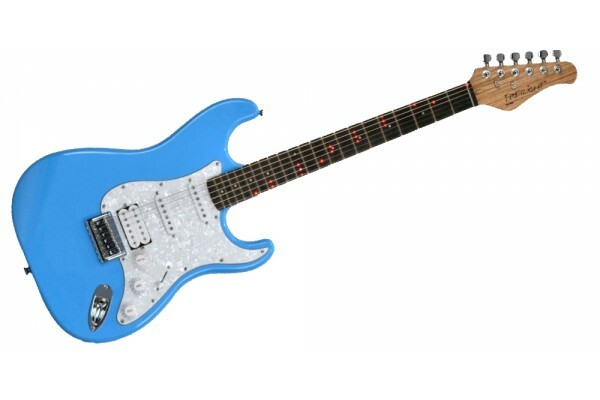 This strat-styled guitar incorporates sleek lines and supple contours to fit snuggly to your body. The FG-521 has a robust, one-custom humbucker/two single coil set-up that provides you with a palette ofLearn to play guitartones to choose from. 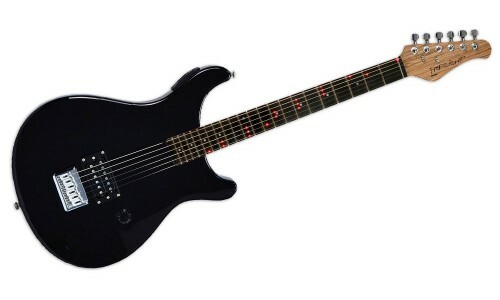 The Fretlight neck includes our patented Advanced Polymer Fretboard and the worlds only built-in LED learning system. Finished with chrome hardware including a fixed bridge, a two-way truss rod and fully adjustable bridge saddles give you complete adjustability for a playing experience that can only be described as pure heaven. And don't forget, the Advanced Polymer Fretboard and Stratabond birch neck gives your tone a sustain that you've only dreamed about! The NEW Fretlight FG-500 guitar sports some significant changes, all aimed toward making the Fretlight the world’s easiest guitar to play. The FG-500’s electronics have been upgraded to an all-new Sonix Flash chipset, complete with on-board capability for future growth, and fully compatible with all existing Fretlight software. The new high efficiency electronics produce the brightest and most consistent LED lights ever. Whether you’re lighting a simple riff, or a scale across the entire fretboard, the lights will maintain a consistent brightness. Additionally, all FG-500 guitars have a Stratabond™ neck. Stratabond is a state-of-the-art engineeredLearn to play guitarhardwood that yields uncommon strength and rigidity across ever changing environmental conditions. Perfect for a guitar necks that are susceptible to expansion and contraction due to varying humidity levels. The FG-500’s Stratabond birch neck will provide very consistent performance for years to come. The Fretlight lighted guitar learning system allows a player to light-up songs, over five thousand chords and scales patterns, and riffs right on the neck of the Fretlight guitar. The Fretlight connects to a PC or Mac and there are lessons, songs and interactive videos available which all light up the guitar. Position 2: Neck - Middle Pickup. (b) LED circuit board layer. (d) All of the layers put together. LED's for all 21 Frets. ACCORDI, SCALE, ARPEGGI, TRIADI, INTERVALLI, DEL PROGRAMMA ''STUDIO''. НАУЧИШЬСЯ ИСПОЛНЯТЬ ЛЕГКО И БЫСТРО ЛЮБЫЕ ВЕЩИ КАКИЕ ТОЛЬКО ЗАХОЧЕШЬ ДАЖЕ БЕЗ УМЕНИЯ ЧИТАТЬ НОТЫ. СПЕЦИАЛЬНАЯ ГИТАРА С ПОДСВЕТКОЙ ИЗ 132 ЛЕД ПОДСКАЗЫВАЮЩИХ АККОРДЫ. Супер крутая гитара со специальным грифом с 132 лед. Siamo orgogliosi di presentare la distribuzione Italiana di queste sorprendenti chitarre. La più innovativa chitarra degli ultimi 20 anni finalmente è arrivata ! La chitarra che legge la musica e trasforma le note in impusi elettrici che accendendo piccole luci sulla tastiera della chitarra. La chitarra che ti insegna a suonare ! Centinaia di scale, accordi, arpeggi, ecc. non è necessario saper leggere la musica. Questa chitarra legge le tablature del programma GUITAR PRO. è necessario l'utilizzo del computer. Non è mai stato così facile imparare un assolo. compresi con lo strumento 6 DVD. Solo pagamenti al momento dell'ordine e spedizione con corriere.